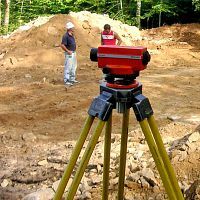 Levels and surveying equipment isn’t just for road workers – understanding the grade of your job-site is an important step in a variety of landscaping, hardscaping, and construction projects. And when you consider the rainfall we see on Vancouver Island, it’s easy to appreciate just how critical achieving the right water “flow” can be! Note: rental does not include tripod. Our Can-Measure automatic builder’s level features 24x magnification and a variety of controls for incredibly fine adjustment. Fits both builder and laser levels. This telescopic tripod fits our Builder’s Levels (above) and Laser Levels (below). Weighs approximately 11 pounds. Stop setting bubbles! This automatic self-leveling laser level is quick to learn and simple to use for accurate and reliable measurements. A popular addition to the builder’s and laser levels. We carry a variety of sight sticks to compliment our range of laser level and builder’s levels. Features an LCD read-out and auto-off. Set to zero and start walking! Features an LCD display, 12” wheel, and can measure in metric or imperial unites. Subtracts from total distance when used in reverse. Easily retractable, high visibility tape. 300 feet of high visibility fiberglass tape packaged in a handy open case. Also features a long handle for quick rewinds. A fun and functional rental. Our Fisher F4 is a great all purpose detector. Recommended for coin shooting, relic hunting, and beach hunting, this is an easy-to-use, functional rental item. Technical features include: visual target ID (by category), numeric 0-99 readout, 11 segment digital target ID, 4 tone audio ID, one touch notch and pinpoint with numeric depth readout, and an 11-inch bi-axial search coil. Primarily used to find property pins. This unit locates buried objects with ferromagnetic properties, such as surveyors’ stakes, rebar, and cast iron or steel pipes. This metal detector will not work on most precious metals.